The Vancouver Canucks defeated the Florida Panthers 3-2 on Saturday night, but the victory may have come with a heavy price. Elias Pettersson, who has collected a point in every Canucks game this season – including Saturday – left the game in the third period after he was slammed to the ice by Mike Matheson. The rookie got the puck along the end boards and, after playing it, was checked hard and then thrown down by the defenseman. It looked like Pettersson’s head made contact with the ice. Play was stopped as the 19-year-old was woozy and unable to stand under his own power. No penalty was called on the play despite it happening right in front of one of the referees. Earlier on the shift, Matheson was crossed-up by Pettersson and bumped the youngster near the net just seconds before the violent slam. Canucks head coach Travis Green didn’t provide an update on Pettersson’s injury after the game, but he didn’t shy away from sharing his thoughts. Prior to the injury, Pettersson notched his fifth goal of the season. 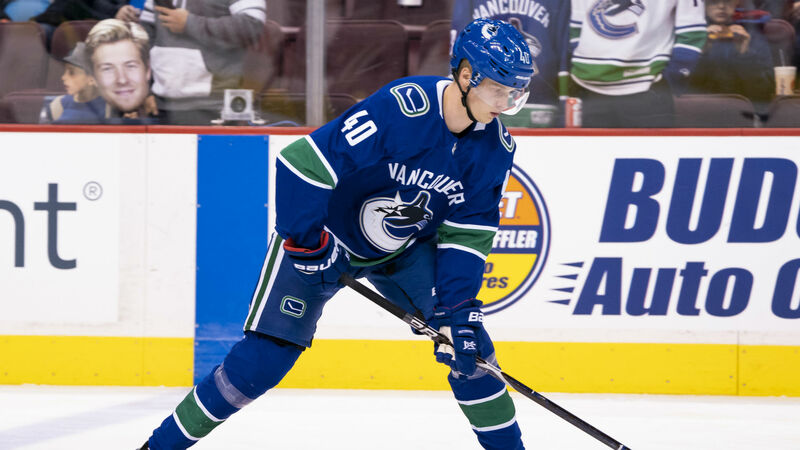 As the Canucks were on the power play in the second period, Sven Baertschi won a puck battle along the board and fed Pettersson who was at the top of the right faceoff circle. The youngster showed great patience as he held the puck before firing the wrister top-shelf past James Reimer to tie the game, 1-1. With the goal, Pettersson extended his point streak to five games to start a career, tying Don Tannahill (1972-73) for the Canucks record. Vancouver may also be without Jay Beagle. The center left the game in the third period after blocking a shot.